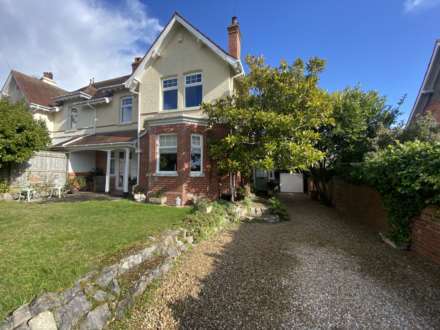 Offered for sale with NO ONWARD CHAIN and situated within level walking distance of Exmouth Town Centre, Train Station, Exe Estuary Trail, Schools & Parks is this 3 double bedroom and 2 shower room semi detached house with an easy to maintain rear garden. This gas centrally heated and uPVC double glazed (apart from 1 window) property comprises, on the ground floor, of bay fronted living room, open plan kitchen / dining room, sun room and shower room / utility room. On the first floor are the 3 double bedrooms and further shower room. There is off road parking for 1 vehicle with ample on street parking. This is a good sized family home in a great, central, location. Walk - in uPVC double glazed bay window to front. Focal point of fitted gas fire within a fireplace surround comprising a tiled hearth with a wooden mantle and surround. Radiator. TV point. Dado rail. Wall mounted central heating thermostat. Coved ceiling. Obscure glazed window to side. White suite comprising shower cubicle with electric shower unit, low level WC and vanity wash hand basin. Cupboard storage units with roll edged work surfaces and tiled splash backs. Space and plumbing for washing machine. Radiator. Tiled flooring. Wall mounted, gas fired boiler supplying the central heating and domestic hot water. uPVC double glazed bay window to front with fitted storage. Fitted wardrobes to either side of chimney breast. Fireplace recess. Radiator. Dado rail. Coved ceiling. uPVC double glazed window to rear. Fireplace recess. Radiator. Coved ceiling. uPVC double glazed window to rear. Radiator. Coved ceiling. Access to insulated loft space. Obscure uPVC double glazed window to front. White suite comprising walk - in shower with electric shower unit, low level WC and wall mounted wash hand basin. Fully tiled walls. Heated towel rail. Inset ceiling lights. Coved ceiling. There is an enclosed and level Front Garden, laid to gravel, having ease of maintenance in mind. Rendered wall boundaries. Timber shed. Double wrought iron gates gives access for off road parking for 1 motor vehicle. The enclosed Rear garden also has ease of maintenance in mind being laid to patio. Outside water tap. Timber fenced boundaries. Front pedestrian access to side of property via timber garden gate. From our prominent Town Centre office, proceed down Rolle Street, Past The Strand gardens, turning left at the first roundabout and right at the second into Marine Way. Take the first left into Southern Road where the property will be found on the left hand side, clearly identified by our For Sale sign.